Although acupuncture has been an accepted treatment in the East for more than 2,500 years, it has only been in the latter part of this century that the practice has gained credence in the West. In the last decade, acupuncture has made great inroads in North America, earning much respect in a relatively short time. Recent surveys show that over 20 million Americans have tried acupuncture. About 16,000 licensed acupuncturists including 5,000 MD’s in this country perform acupuncture. Today, surveys show that nearly one in seven chiropractors uses acupuncture to treat patients, and another two-thirds employ acupressure. Also interestingly, many veterinarians effectively use acupuncture on animals, thus dispelling the myths that benefits are “all in the head” or “by the power of suggestion.” The National Institute of Health has supported its effectiveness in certain pain disorders. Now, researchers at the University of New Jersey, College of Medicine and Dentistry recently provided definitive proof that acupuncture works. They used functional magnetic resonance imaging (fMRI) to show that acupuncture causes a decrease in pain-related brain activity. Many people also seek an acupuncturist for weight loss, to quit smoking, other addictive behaviors, and for general health and wellness. Modern science considers two main theories. Needling the acupuncture points stimulates the nervous system to release natural protein substances or chemicals (endorphins) in the muscles, spinal cord, and brain. These chemicals will either change the experience of pain, or they will trigger the release of other chemicals and hormones which influence the body’s own internal regulating system. Based upon the Chinese principle of balancing YIN and YANG meridians (positive and negative electrically charged energy channels), modern science considers the flow of “bio-electrons.” When positive and negative charges in the bio-electronic movement are not balanced, disease eventually results. When balanced by correct needle placement, the proper flow of bio-electrons results in pain relief and good health. Dr. Bronson offers acupuncture only as a modality for control of painful musculoskeletal conditions, not for the array of medical conditions that are in the realm of the licensed acupuncturist. 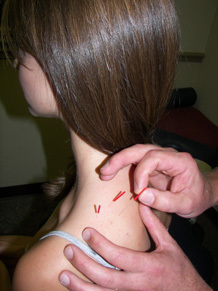 Although controversy abounds regarding the terms “invasive” and “incisive,” the insertion of needles by Dr. Bronson is not meant to invade any cavities of the body or to cut any tissue, but only to improve the biomechanics of the musculoskeletal system of the body so that the patient might experience relief of muscle spasm and pain, and greater ability to engage in sports, adventures, work, or simply the common activities of daily living. Dr. Bronson’s technique is usually painless and has a track record of a very low risk of adverse reaction. Most of our patients experience reduction of pain from the procedure and feel better immediately. Outcomes will vary from patient to patient.